Holy Poop!! That is nuts! OK Alvin. Now I KNOW I have to get you to Chiva Falls some weekend after it snows. Our Cruisers (80 and 100) luv being in there. On that last trip with Brian we went back to the Pools. We must have been in DEEP for several minutes. In REAL DEEP for a few minutes. Come on down. I'll getcha in there and you'll luv it! ther is also a boot that covers the distributer, used to be on mustangs, i have one on my distributer, i like this as opposed to silicone. if you watch e bay you can find them once in awhile or any ford dealer can get you one. heat shrink is a MUST! the raised vent lines and repacking of bearings also. there is also a marine grade crc spray it is excellent, a little pricey but excellent. i will try to find the brands name, i can not remember right of hand. and in a pinch along with the WD40 and papertowels, Vaseline helps alot, if you get caught "with your pants down" Vaseline will deter water, its just not a permanent solution. Pangea you run a great site! !, i often find myself surfing your site, i would really like to see more info for that rock crawler! but i did want to compliment you on a job WELL done! I keep seeing WD40 and Paper Towels mentioned, but what all are you guys hitting with this? I'm a bit ignorant in this area so I'm very curious. distributer , cap , rotor, and wires...wd40 was orig mfg for gov. it stands for Water Displacement and 40 was a ref or chem # but wd40 removes moisture and wettness VERY WELL. hope this may help you. It's possible to waterproof ignition systems and keep the engine breathing and running but if you get stuck in water (it can happen! ), it's almost impossible to keep water from getting in somewhere. After getting high centered on a submerged log in a swamp in Ocala, FL, I learned that having a good drain plug at the lowest part of the cab is a really good idea. Once I got my soggy bottom out of there, the MJ was filled to the arm rests, opening the door was rather comical but a puddle of water remained just below the door jamb until I discovered the factory drain plug that is used when they dip gavanized the body. I banged it out with a hammer, let it drain, put on some dry socks and kept on wheeling! Also just another side note, toilet paper is super absorbant. Sometimes works a little better than paper towels. Works great on distributor caps. wow this is an old thread, BajaRunner you should start by checking out 4Crawler's website...you'll find tons of other info you realize you needed. Waterproofing with a rubber glove or bag is not a good idea because it depletes the air and ionizes. You'll get misfires for a different reason. I used to waterproof my distributor and other components by pressurizing them. We used a small 100% duty cycle compressor. The compressor had it's own snorkel so it could run underwater. We ran a hose to the top of the distributor. At the bottom some have a small drain hole. If it doesn't, make sure you make a very small one. Once you turn on the compressor, the pressure inside the distributor is greater than the water outside, so water will never get in. You also have a good source of air to guarantee a good spark. We did the same with the winch motor, which at the same time cools it. Other things that must be considered but not yet mentioned that I've done on mine (or planned to do). some fuel tanks have vent lines. if your gas cap is a rigid and not venting, you likely have a vent lines somewhere so that fuel tank doesn't vaccum lock when fuel is drawn out. Timing cases tend to have vent holes. On the land rover diesels, there is a wading hole that must be plugged with a threaded plug. For TDI's, your boost diaphragm has a vent. you'll get water in there if you go deep enough. diesel or petrol coolant heaters have an exhaust, and intakes that need to be sealed prior to wading. you want to make sure that the air intake routes you have are all sealed and in good condition. for example, does the air filter box you use have good sealing? are all the clamps holding it together in good shape or is it being held on by less than all. would you trust that water UNDER PRESSURE would not come into your intake path anywhere other than the end of your intake? For those of you who decided to not replace that fan clutch and bolted your fan straight to crankshaft, when that fan hits the water there's no give. That means when you enter revving for that cool picture, you are likely to bend your fan blade. Even with a fan clutch, a floating object like a stick can enter into your engine compartment while wading and when your fan hits it, blades will likely bend out of balance or worse. 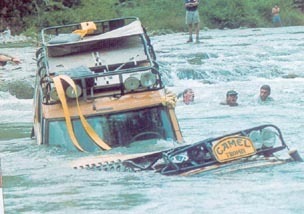 I had a fan blad bend on my old CJ forward and shred the radiator back in AZ during a wading. I keep the CORRECT long wrenches on board my 110, and it takes about 2 minutes to remove my fan for a wade. this is one of the things you can do prior to a deep fording while you are ALLOWING YOUR BLOCK TO COOL so it doesn't thermal crack when it hits the water after running hot. You also have time while someone is doing a recce of the crossing point. you're going to do that right? never drive through blind unless someone else has done it. Last but not least, underbody armor. particularly the armor for diffs and steering drag links. Can't see much under water, and doesn't take much to do damage by anything in the water that doesn't move under water. I think Overlander pretty much covers it. Nice writeup. The point about using a compressor to pressurize the distributor was well made. I think several military vehicles over the years have had fording kits that, once turned on, provided a slight positive pressure to the diffs, transfer case, transmission, and crankcase. Obviously, if not well designed this could be hell on seals, but the concept has great potential to successfully prevent water intrusion. Where do you think I got my idea from?